Snow, snow, snow! 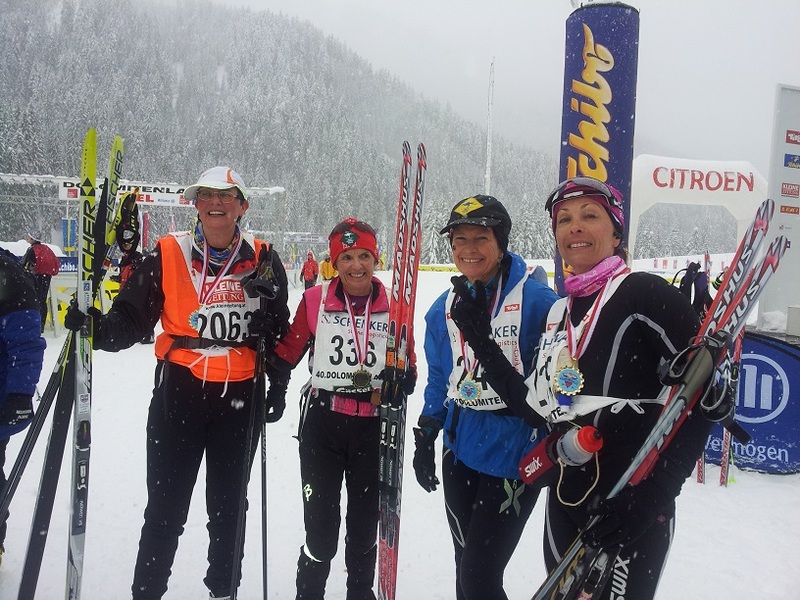 It was superb to have lots of snow with beautifully groomed tracks at Obertilliach for Saturday’s 42km classic race. 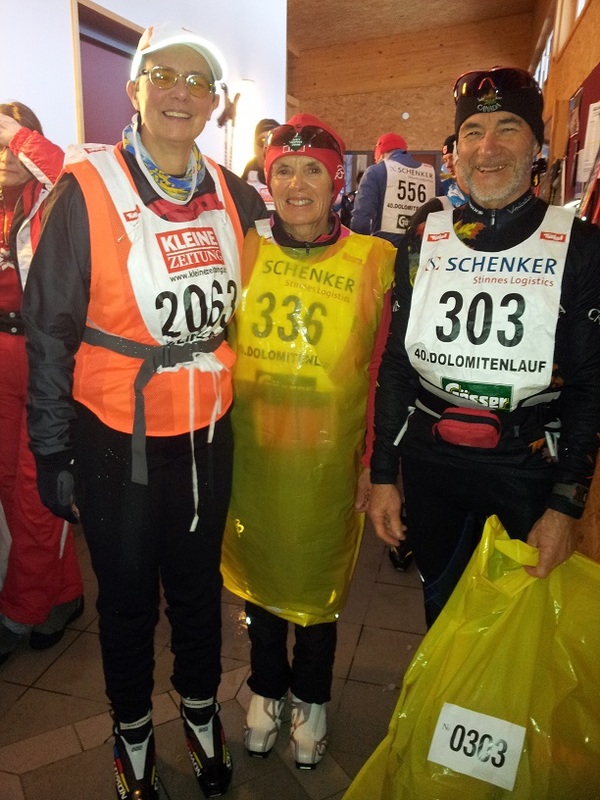 Even though there was skiable snow at Lienz, due to warm temperatures and predicted rain in Lienz, Sunday’s 60km freestyle race was moved to Obertilliach and shortened to 42km which was a great decision by the race organisers as on Sunday morning in Lienz it was pouring rain. Earlier in the week on Thursday night the Romantiklauf was held in Lavant. It’s was a great social event with a 4km candlelit course around a local golf course with the Dolomites towering overhead reflected in the moonlight. Skiers can start anytime between 6-8pm with the winning skier being the person who scores the median time. Afterwards, skiers from many different nations socialise over goulash soup in the golf clubhouse. There’s even a prize for the skiers who have travelled the furthest to reach the race. On Friday night the elite sprints are held in the Lienz Town Square. Snow is trucked in and scaffolding is used to make an exciting course of jumps, tight corners and short sharp ups and downs. It provided entertainment for skiers and townsfolk alike despite the light drizzle at times. The Dolomitenlauf race course began at the Obertilliach Ski Centre and headed down the valley via five zig zags followed by a meander via the creek to reach Untertilliach for the first drink station. Some wild and long descents! After crossing the creek the track gradually ascended back to near the start area where the short race (20km) turned off to finish. The 42km race began a serious climb up, up, up through the pine forest which challenged all. You certainly knew if you had completed sufficient pre-season training. The track was narrow which made it difficult to overtake especially in Sunday’s freestyle race. Finally the hill relented and skiers were rewarded with an exciting ‘bob-sled’ descent to Kartitsch and downwards for several kilometres to the start area for the last drink station before heading out to for the final 8km, skiing the zigzags 1 more time. Many found the zig-zags quite exhausting at the end of race because the significant camber made it difficult to get in a rhythm. For some skiers on Sunday afternoon the zig-zags were near whiteout and it was difficult to stay on the groomed trail without falling into the soft snow on the side of the tracks. Saturday’s race with over 950 participants was held in cloudy overcast conditions with some light drizzle later in the day. Arriving in Obertilliach on Sunday morning it was dumping down large thumpers of snow after an overnight fall of 25cm. The snow eased off during the morning but at times (near Kartitsch) it was quite windy and cold. 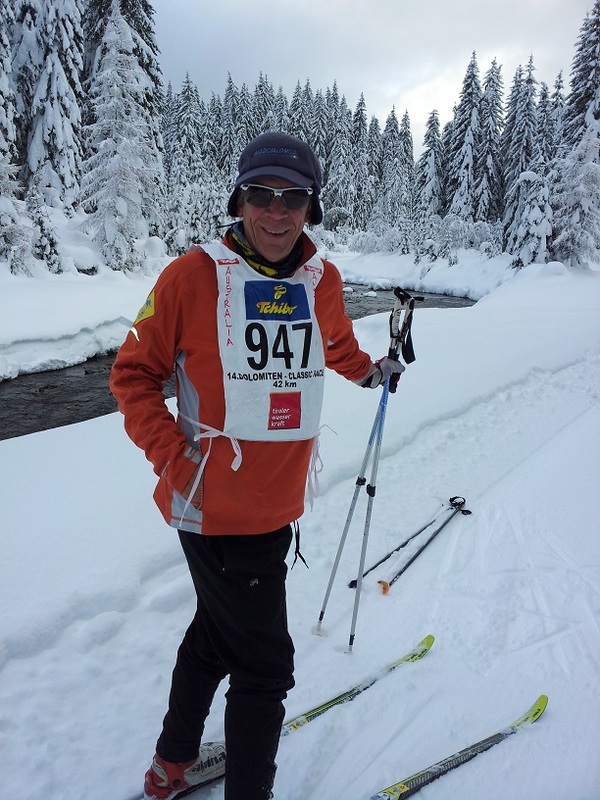 There were many Worldloppet masters skiing at the Dolomitenlauf including: Hannes Larson, Robert Palliser, Grant McLeod, Jan Hurley, Doris Truman, Bruce Wharrie, Nancy Caviet, Jan Vadlejch, Raimo Valkonen, Jay Weiner, Brian Bennett and myself. Sorry for those I’ve missed naming.